Professional garden designers deserve to have a nice yard at home but usually don't get around to treating themselves to their own design work! I waited 13 years to create a dream yard for my family. So, don't feel too badly if you haven't tackled your landscape project yet. Where's the Garden Police When You Need One? Shirley Bovshow, designer co-host of garden makeover show, Garden Police. 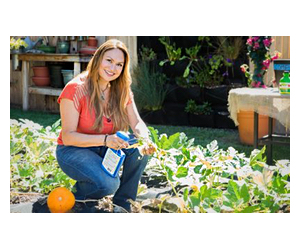 As garden designer and co-host of Discovery Home channel's "Garden Police" show, I was especially embarrassed of how my yard looked during the period I was taping the show. On Garden Police, my design partner, Michael Glassman and I "patrolled" the streets of Los Angeles looking for the ugliest front yard on the block and then "busted" the homeowners for design infringements. After the homeowners agreed to invest some "sweat equity" in their yards, Michael and I would design a new yard for them. FYI- Do you recognize the copycat show, "Desperate Landscapes" on DIY? Our show was first and I just made up a rhyme! My yard looked worse to me than the properties we made over for the show! I kept my disaster yard a secret from my co-host and producers. Whenever a script or prop for the show had to be delivered, I always volunteered to pick it up from the studio. There was NO way I was going to let anyone related to my show know that this Garden Police had neglected her own yard! I feared I would be "exposed" and ridiculed! The reality was, I was investing all my time making other peoples yards look beautiful and I had no time for my own. Need I mention, "The cobbler's children have no shoes? Shirley handpicking the tumbled stone for her new dry stack retaining wall. The garden makeover projects we completed for Garden Police were "real landscape" jobs- complete with proper drainage, irrigation and construction. Garden television makeovers are exhausting to do and as real-life landscape designers, Michael and I insisted that the yards we made over be done to professional standards, not just for "TV." After the cameras stopped rolling, Michael and I would stay late into the evening at the projects to make sure everything was installed correctly. When we weren't taping consecutive garden makeovers each week, I was working on landscape projects for my Los Angeles area clients. With this over-taxed schedule, can you blame me for ignoring my own yard!! The only time I had to work in my backyard was on weekends. My typical suburban tract backyard- a rectangular yard with a weed infested lawn and a boring concrete patio that offered no shade! I longed for a "destination backyard" that reminded me of the places I visited during my honeymoon in Italy. My list of "design must-haves" included a dynamic multi-level entertainer's yard with outdoor kitchen, dining room, living room, a new "master bedroom" outdoor spa retreat, waterfall and pond, ornamental and edible gardens, a firepit, fireplace and some shade structures! The plan was to implement double duty landscape features to get the most use of our limited space. Built in fireplace seating functions as a screen for the master bedroom above ground spa. Built in fire pit curved bench is also a retaining wall for the new raised gardens. A carefully positioned fireplace to screen an ugly view of neighbors yard. A landscape full of edible plants that functioned as shade plants, privacy screens and more. Considering my yard functions as design studio and lab the challenge was integrating all these structures with style. 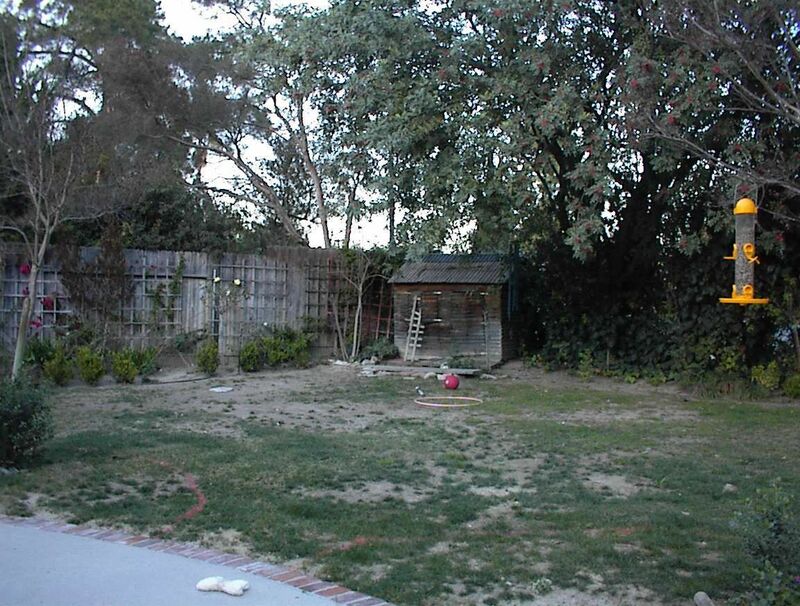 Prior to the landscape redesign, our yard was practically abandoned by the family and rarely used for five years. With no shade structure for the patio and an unattractive garden, only our dog, Whiggy found the yard useful. Our trash was his treasure. This is what my yard used to look like. This is the outdoor area that I transformed into a "master bedroom spa retreat" instead of expanding my bedroom. My husband enjoys the spa every morning and sometimes at night too. Finally, the yard is being used daily! When a spa is located near the master bedroom it is more likely to be used than if you have to wander the length of your yard to get to it! Susan Harris of Garden Rant blog visited me and took the following video of my yard. I'm not embarrassed of my yard anymore! Absolutely beautiful…It is an example of a great transformation. We have a garden the size of a football pitch, which has been badly neglected for years, we live in the countryside and it would be so nice to see some wildlife in the garden. This garden would be your biggest challenge!!! Thanks for your kind words. I have a feeling you will visit me one day! Thanks Yvonne. We are enjoying it every night after sundown since it’s too hot for day time use these days. 100 plus degree temperatures~ Hope you are cooler. That is one amazing garden. Gorgeous seating areas, so inviting. I just love it. Thanks Marie- Let me know when you come to L.A. for a private tour and lunch on me! Wow, Shirley! You’ve been busy. I love all the stone and the levels. The mirror reflecting the garden is a brilliant idea. Does it cause any problem with glare or reflected heat? Probably not. You’re too clever for that. It turned out gorgeous. May you have many years of enjoyment. Thank you to Susan, who seems to be everywhere these days, for giving us the tour. I already knew your gardens were spectacular from the little snippets you’ve shown us. But the video makes it more real. I also viewed your album and got a better look. I would have come and commented sooner but it’s been my anniversary, my son’s b-day, and we’ve had several 4th of July celebrations to attend. I like the outdoor fire pit which made me immediately realize you could hear the water, feel the warmth of the fire, and feel the California breezes. Perfect combo! And you have a nice hammock tucked away for some sleepy afternoons. That golden glow all over would sure relax me for certain. The levels add a lot of interest and make the space seem larger. It’s pretty unbelievable that you accomplished that between jobs over a 4yr span. Lots of heavy lifting and plenty of planning ahead. I really enjoyed the tour and hope to see it in person one day. Thanks for letting us take a looksie and thanks to Susan for sharing. I have TURF!!!! Go look. It’s been 105F+ for a couple of weeks, I’m cutting back on the water gradually, and it’s thriving. When you get to that point, it’s also easier to mow than bermuda. It’s fluffier with finer texture, so it mats less in the mower bag, and composts nicely without as much risk of turning into a stinking mass of green slime. Hi Gail, thanks for visiting and your compliments! Thanks. The yard is very relaxing to be in. I enjoy watching the hummingbirds and wildlife come out and enjoy the yard as well. Thanks Laurel Street. Yes, the video kind of ties all the photos together and gives you orientation. I’m glad you enjoyed it. Hi Lazy Gardens= Thanks. You are right, the garden is extremely low maintenance. All the plants are low water and get by with minimal watering. I let them grow natural so that is a labor saver as well. How is your UC Verde lawn these days? Thanks so much Michelle. I value your opinion because you are a great design talent and nice person! I enjoyed seeing the transformation. You’ve created a timeless sanctuary. The shoemaker’s children go barefoot, the landscaper’s yard stays a weedpatch. It looks great, and not high maintenance. So glad I got to see that – the video really helped me understand how it all comes together so well! Thanks – that was fun! Absolutely beautiful. What a wonderful, relaxing destination you created. LOVE IT. Well done!